Berry season is upon us and I couldn’t be more happy. Whether you’re looking for strawberries, blueberries, raspberries or boysenberries, the fruits are becoming readily available and at affordable prices. This berry cobbler is versatile and a great use of any type of berry or soft and juicy fruit. Over the past couple of weeks, I’ve been wrangling with our excess of strawberries. I made strawberry cornmeal muffins, jam and froze a bunch for later use, but I still had quite a few in the fridge. Myrnie from I Wonder Woman suggested Magic Cobbler, which I hadn’t heard of before. The recipe is simple and perfect for those afraid of baking. You mix a batter and pour it into a pan, then drop handfuls of berries on top. Bake and eat. Seriously, it’s that simple. AND, the taste? Out of this world delicious — I’ve made two cobblers since receiving the recipe. It’s that good. I’ve played around with the recipe a little bit, adding some cinnamon and nuts, both of which are optional. Preheat oven to 375F (190C). Add butter to a 9×13″ baking pan and place in oven to melt. I placed it in the oven while it preheated, just remember to keep an eye on it. In a large mixing bowl, combine flour, granulated sugar, milk, baking powder, cinnamon and salt. Whisk together until a thin batter forms and is without any lumps. In the baking pan with melted butter, pour in the batter. Do not stir – the butter will ooze up around the batter and may pool on the top. It’s ok.
Sprinkle berries evenly over batter, then sprinkle with nuts and brown sugar. Bake for 45-60 minutes or until it tests done. The top will be a beautiful golden color. I used a mix of 3 cups fresh whole strawberries and 2 cups fresh blueberries. The ratio of fruit to cake will be nearly 1:1, which I like. I’ve made the recipe a second time using 2 cups each of flour, milk, and sugar but found that it yielded more cake than I preferred. Also, during the baking process – somewhere around the 45 minute mark, you may look at it and think it’s not going to turn out. The berries begin to burst and their juices puddle on top. It looks as though it’s going to be a watery mess, but the juices absorb into the cake by the end of baking. If you’re looking for a gluten-free version, check out this Blueberry-Strawberry Cobbler recipe from Karina’s Kitchen – she did an amazing job! Looks amazing. I’ve had the same strawberry problem in my kitchen. Made strawberry margarita ice pops, strawberry buttermilk pancakes and just for funsies added macerated strawberries to Prosecco to make a bellini. Ya know… throw a little vanilla ice cream on top of your magic cobbler and you’ve got yourself a pretty patriotic dessert. I’m just sayin’. Sounds great! I’d love to eat it warm with a scoop of vanilla ice cream on top! I may have to try this. Like, yesterday. Strawberries and blueberries in a cobbler? Love the combo. Beautiful. So glad you enjoyed it! If Grandma Mary was still with us…well, she’d be tickled pink you enjoyed her favorite dessert :o) I’ll have to try it with pecans and brown sugar next time- sounds divine! Hi! Myrnie’s twin sister here – she’s right. Grandma would LAUGH if she saw her recipe published. I must admit, though – you make our family recipe look positively cosmopolitan!!! Oh, and it’s AMAZING with Cool-Whip (yes, really) or vanilla ice cream. Yummy!! great – perfect timing! i’m making this later in the afternoon! thanks!!!!! Yum! The strawberries are perfect right now. Your cobbler looks delicious and so beautiful. I bet it was finger-licking good. what a delicious way to use up those berries! I bet I wouldn’t be able to keep my husband away from it! This sounds very simple, something even I could bake. Looks perfect for 4th of july! After showing my boyfriend this post, he said “make that!” Will be throwing together your cobbler for our fourth of July get together–strawberries are 99cents/pound this week. what timing! talk about tempting photographs… you got me at the first! Looks delicious. I especially love the next-to-last photo where it looks red-white-and-blue! Goodness, this looks so good, and so pretty. That looks fantastic…I want some RIGHT NOW!!! I made a Blueberry and Strawberry Buttermilk Cake from Pinch My Salt’s site and it was terrific. But this looks really extraordinary. I may have to make it for July 4th! Thanks for this…in time for the 4th! That blueberry cobbler looks really good! I made this tonight with rasberries & blueberries, cut the sugar in half, no nuts, added a little vanilla, it was the BEST! Thank you for the inspiration. Next time, even less sugar the fruit makes it sweet enough. Yummy. I hosted a team meeting last night and had strawberries and blueberries on hand. After searching the internet for a new recipe to try, I came across this one and realized I actually had every ingredient in my pantry (which is rare). This was an absolutely delicious recipe and I have saved it as a favorite in my binder to make again. It was so easy and soooo yummy! 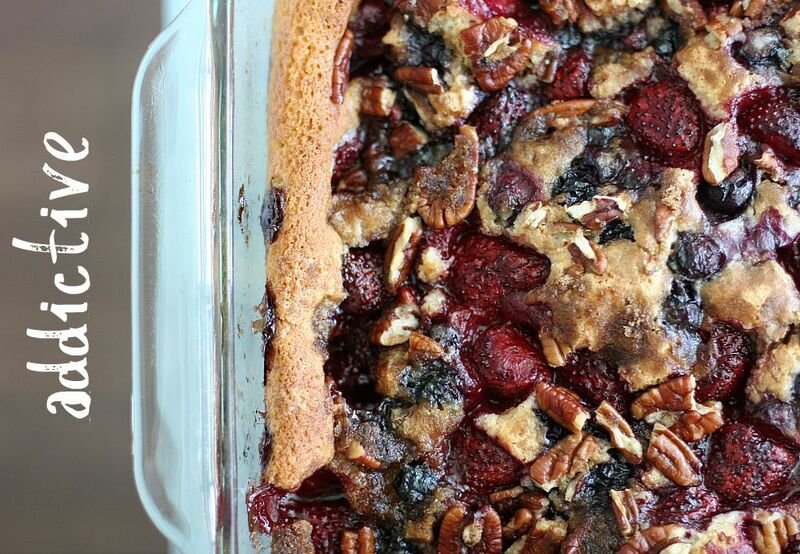 I plan to make this cobbler next week. But, instead of a 9×13 pan I have a 13×9 pan. How can I increase the recipe so that it would fit in a 13×9 without losing its texture and making it more cakey? Wow that cobbler is just gorgeous. Saving the recipe and might try to come up with a low-sugar version. Thank you so much for the TERRIFIC cobbler recipe! I and my friend have become the ‘victims’ of this recipe. We can’t stop eating it before it was gone! Now I am baking the second one to give to my other friend, and can’t wait to see their reaction ;D.